This trip is kind of a last minute decision. Peter pitched that idea some time ago but I wasn’t really keen on clipping bolts in February Spanish sun. After all this is middle of ice season! Unfortunately, my standard ice buddies aren’t really keen on doing anything this year (Scotland doesn’t count!) 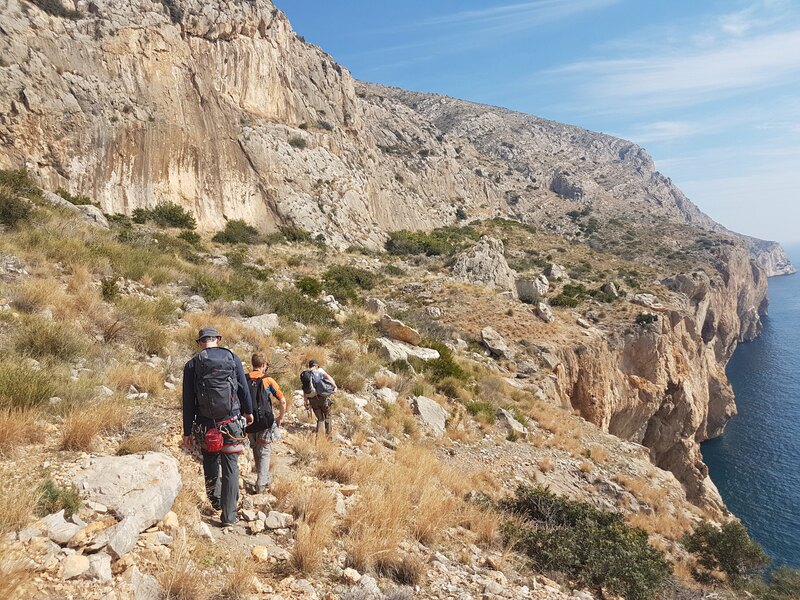 so after consulting my wrist injury with a specialist (I got diagnosed with TFCC) I decided that some change is good and joined Peter, Seamus and Gerard on their exploration of the fantastic climbs of Costa Blanca. 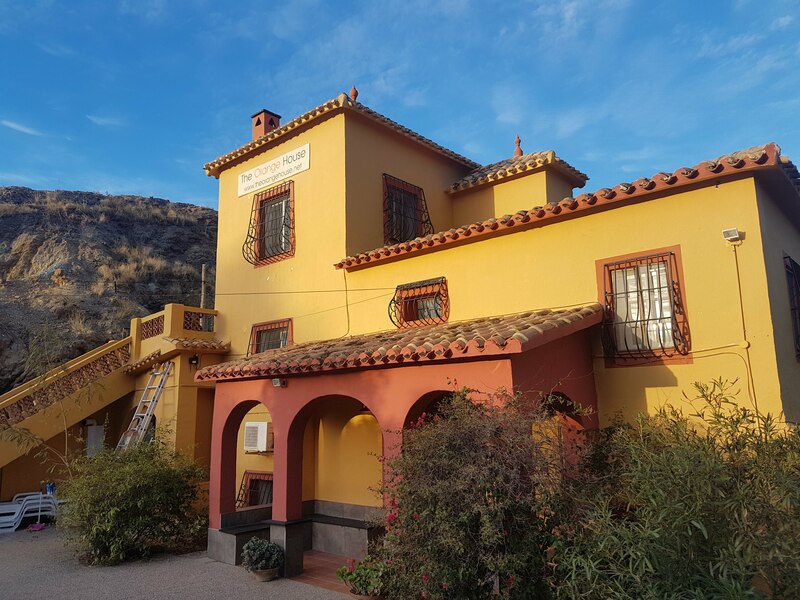 We arrived to Alicante late last night and made our way to Orange House (a very well known climbing oriented hostel) in Finestrat. We only have until Tuesday (evening flight) so the plan is to make most of our time here. 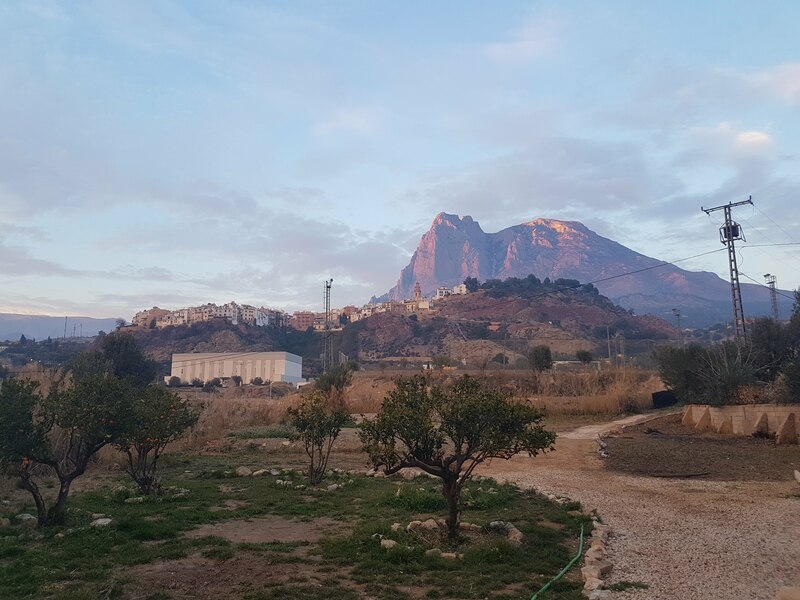 For today the plan was to get up early, pick up some supplies and go to Sierra de Toix. Around 30min drive. Not bad. 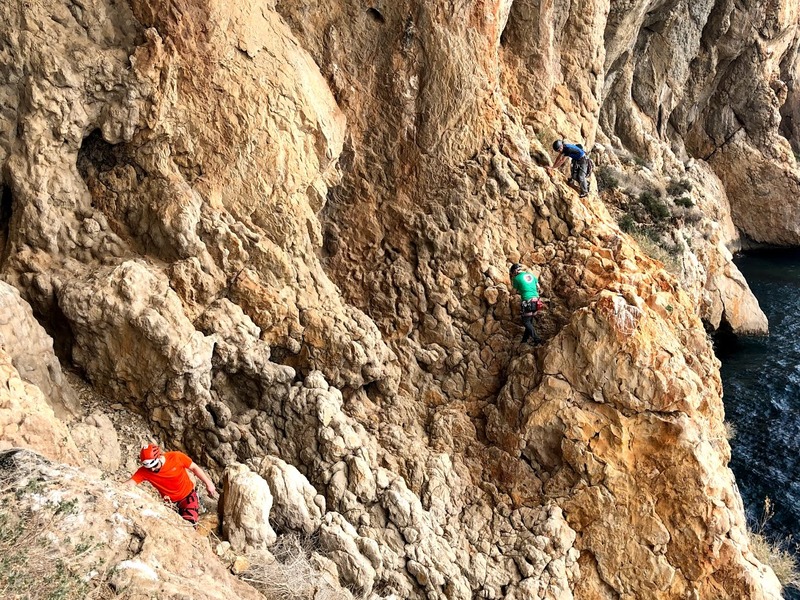 Area has abundance of both single (all grades) and multipitch routes (including sea cliffs). The morning was spent getting to know (or refreshing for the rest of the boys, as they have been here before) the rock. After few leads each (including amazing Energico, 6a+). 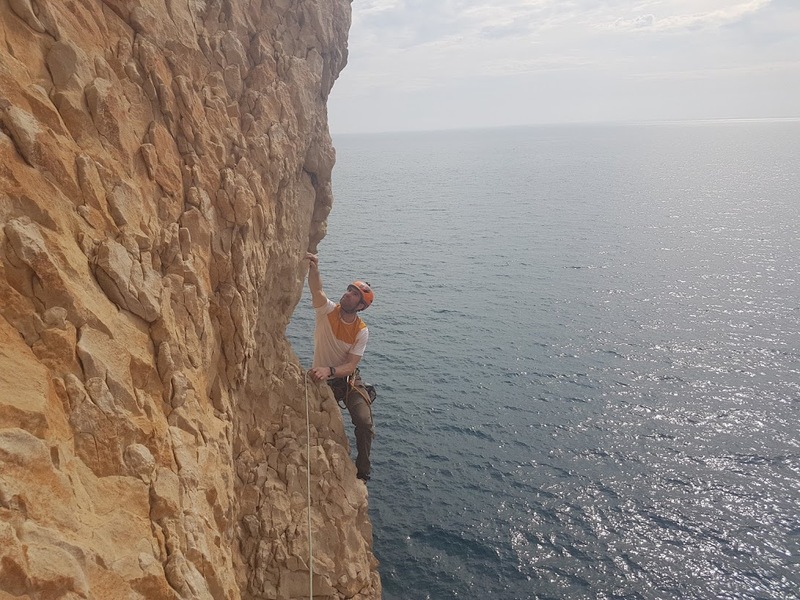 The main course of the day was what is described as one of the top 50 routes overall for and a mini expedition on its own: “Rowland’s Magical Mystery Tour”, 160m, HVS 5a. 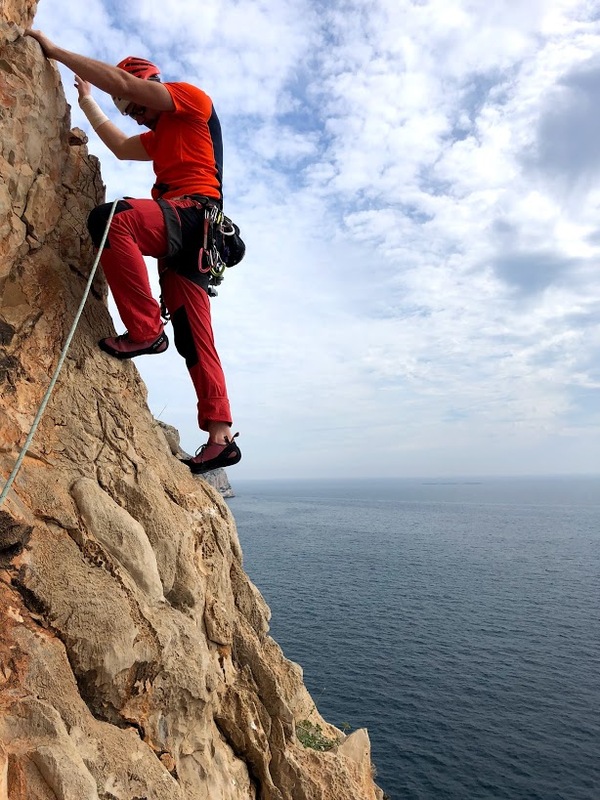 The guide book grades it as trad HVS and suggests bringing some trad gear, but to us, seasoned trad climbers, it looked like a decently bolted sport multipitch route (also, we didn’t bring any trad gear that day anyway). On the way to Mystery Tour. It’s on one of the see cliffs seen to the right. 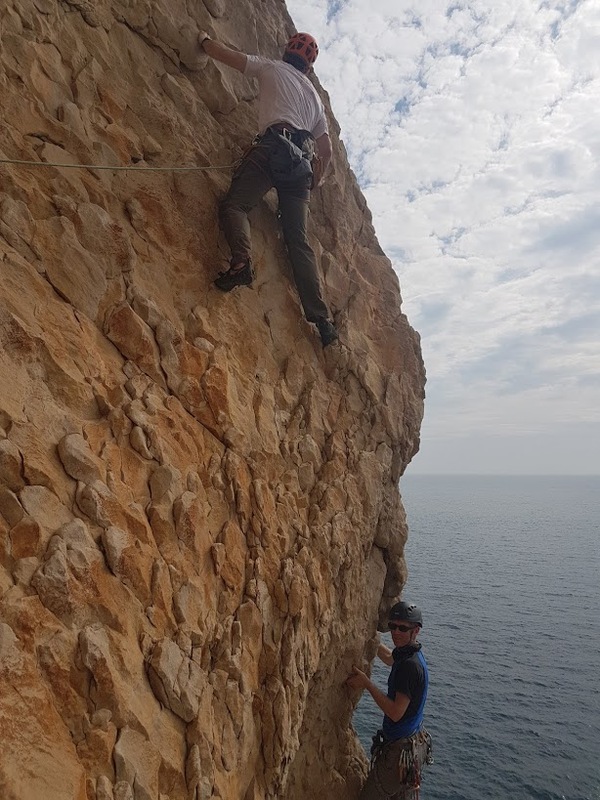 The route starts at the edge of the cliff with free hanging 50m abseil. 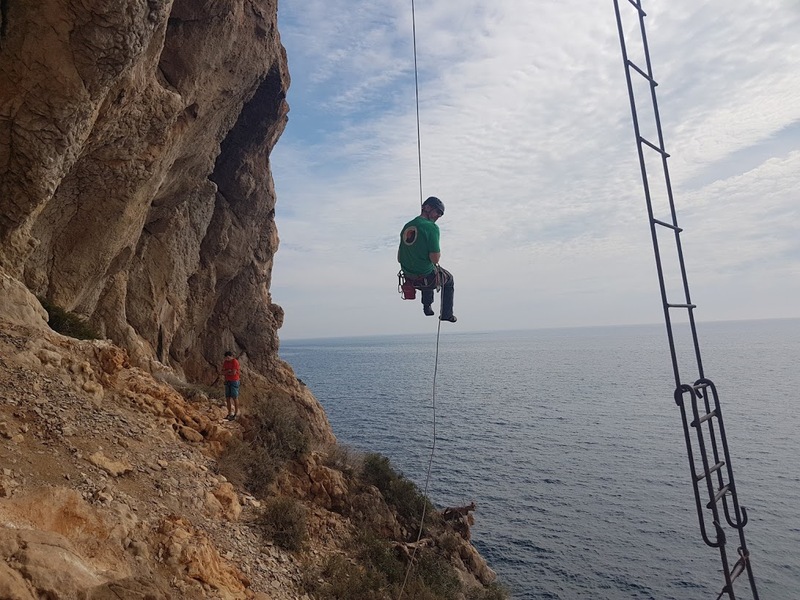 We were lucky that an abseil rope was already in place as it saved time getting down. Seamus on the way down. The Abseil is much more long and exposed than it looks. You go slide down the rope next to some next level dodgy fisherman ladders. Definitely not something I would ever want to use. Once at the bottom you traverse 3pitches. The first two are easily done solo (at about vdiff), third is very exposed 4+. Peter and I went first with me leading the final traverse pitch. Gerard and Seamus were just behind us. Peter checking out the ‘doubious’ holds of the hard part of the traverse (that I just lead). Peter on P4, with Gerard leading the previous pitch. I grabbed the final, Crux pitch which was also very pleasant. 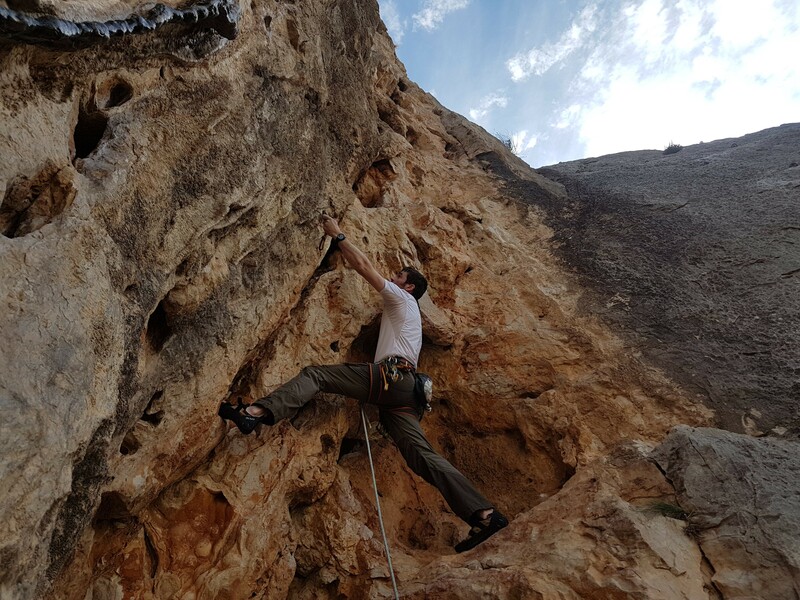 It had everything one might want in a pitch – exposure, good face climbing and a perfect crack leading to the top out. Me setting of on the 5th pitch lead. The route took maybe 2.5h-3h total (including the walking), and because it’s a bit remote there was very little people around (while the crags close to car park were overrun by mostly British and German climbers). It was still early enough. We decided to walk back towards the car, and perhaps find a pitch or two to finish off the day. Overall first day was a great success. We had a fantastic t-shirt climbing weather and everyone had a blast. 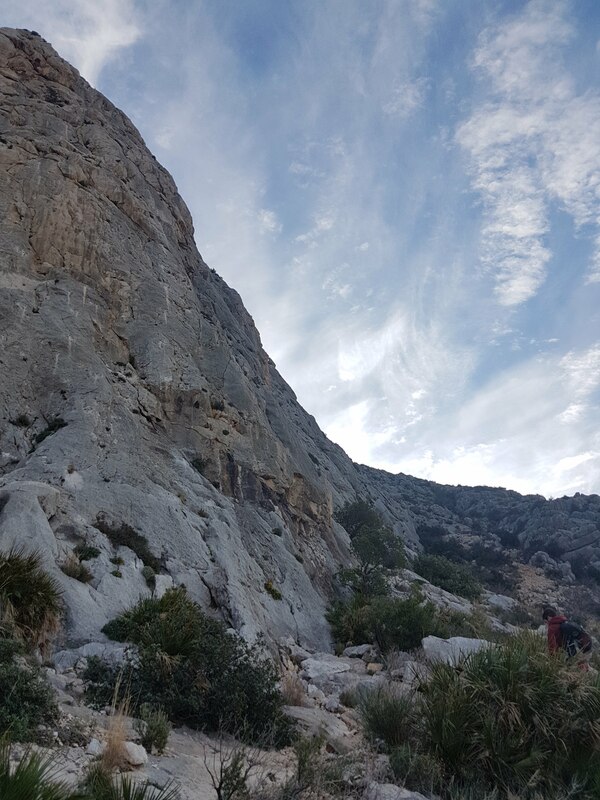 We still haven’t decided what the plan for tomorrow (but it looks like we will the local mega classic of Peñón de Ifach.